Camping Le Palmeraie - less than one mile away from a beautiful sandy beach! 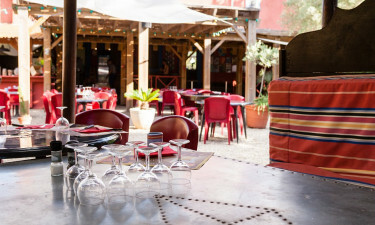 Le Palmeraie is situated in a shady oasis less than one mile away from a beautiful sandy beach. This luxury camping site boasts a very friendly atmosphere that is designed to make families feel right at home, while there are plenty of different kinds of activities for people of all ages to enjoy while relaxing and unwinding at this leading LUX-camp. 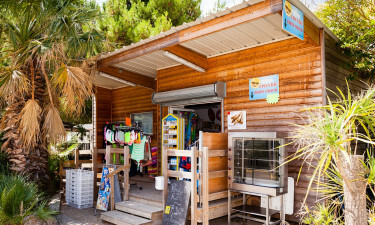 What Makes Camping Le Palmeraie So Special? It is possible to walk to the beach in just a couple of minutes and guests at Le Palmeraie will want to spend plenty of time unwinding on the golden sand and splashing around in the clear water that laps the shore. A number of pretty hiking trails also line the beach and taking a stroll alongside the shore is the perfect way for families to have fun and relax together while soaking up the intense natural beauty of this area. The large solarium is ideal for people who want to spend a lazy day working on their tan. However, people who like to be active will also find plenty to do at Le Palmeraie and the large swimming pool complex is just waiting to be enjoyed by people of all ages. Families who enjoy playing games together will be able to play table tennis and a range of other games as well, while there are also plenty of wide open spaces where families can play football and a range of other types of games together. 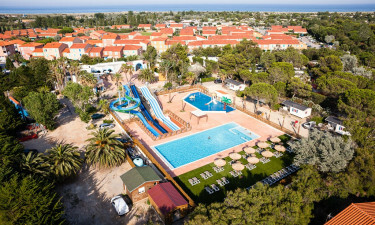 The kids are sure to experience a camping holiday that they will never forget at Le Palmeraie thanks to the special kids’ club. There is also a special play area where children of all ages can have fun and make new friends. Lovers of luxury camping are sure to appreciate the large restaurant at Le Palmeraie, which specialises in classic French dishes as well as a good selection of British dishes thrown in for good measure. People who enjoy alfresco dining will find a number of tables set next to the swimming pool and the restaurant is open from the morning until late at night. Those who are in search of evening will be able to enjoy special evening performances, which are designed to be enjoyed by the whole family, while after the kids have gone to bed adults can unwind in style at the chic bar. Putting together meals for the whole family to enjoy together is easy at Le Palmeraie, as the site features a supermarket that is stocked with a good range of different types of groceries. This makes it easy for guests to create both meals and snacks that they can enjoy in the comfort of their mobile home or pack to take with them to the beach while spending the day on the sand.